When I am decorating for Christmas, I have to take breaks to eat. During those breaks, I kick my feet up and enjoy my dinner with a movie. I frequently depend on the classics like "Miracle of 34th Street" or "Christmas in Connecticut" because I know the stories will be delightfully enchanting. This year, instead of pulling out one of my faithful DVDs, I decided to watch a new movie online. Well, at least for one of my breaks, I decided to watch a new movie. The classics still await! After a brief search on Amazon, I found a new Christmas movie that sounded quite appealing to me. The description of The Spirit of Christmas reminded me of one of my all time favorite movies, The Ghost and Mrs. Muir. Now, it would be most unreasonable for me to think I could happen upon a current day movie equal to The Ghost and Mrs. Muir, but I did very much enjoy watching The Spirit of Christmas. Part of what makes The Ghost and Mrs. Muir such a fabulous movie, are the actors that play the main characters. Gene Tierney is timelessly gorgeous and Rex Harrison is simply a phenomenal actor that is appropriately dark, yet dignified. 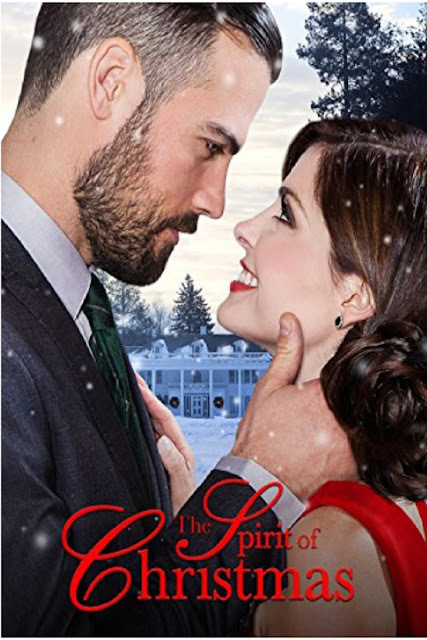 By comparison, the main actress in The Spirit of Christmas, Jen Lilley, is stunningly beautiful and Thomas Beaudoin is a very handsome, distinguished ghost. Both ghosts simply wish to be left alone in their homes. Both women are determined to stay right where they are regardless of moody, sometimes overbearing spirits. The main story takes place current day, but as one would expect with ghosts, the past plays a huge part in the present. Ninety-five years ago, Daniel Forsythe was returning home to his one true love for Christmas when he was murdered in the yard of his home. Every year, he returns to Hollygrove Inn 12 days before Christmas. Present-day, Kate Jordan is a successful lawyer who is not successful in love. Her career at Patton and Turner law firm comes first. And frankly, she isn't sure she even knows how to love. After the death of Henrietta Forsythe, Patton and Turner law firm becomes the executor of the Forsythe estate, which mostly consists of Hollygrove Inn. As such, Kate is tasked with getting the inn appraised and sold before the end of the year. That only gives her 3 weeks to get the job done. The biggest problem Kate faces is getting a loyal appraiser for the property. It is widely known that Hollygrove Inn is haunted by it's previous owner, Daniel Forsythe. Shortly after arriving at Hollygrove Inn in Vermont, Kate meets Daniel Forsythe. He is not at all what she expected. To begin with, he is well dressed and she can actually touch him. Plus, he enjoys eatting real food. He is nothing like what she expected of a ghost. After hearing the story of how he was murdered and how his fiance' subsequently married his brother, Kate decides her number one focus should be solving Daniel's murder so he can rest in peace. Thereby, also resolving the ghost problem of the inn. As Daniel and Kate start working together, digging into his past, exploring his memories, they quickly become friends. She finds that she actually cares about him and what really happened to him. However, it is not that simple and Daniel is not the only ghost haunting Hollygrove. This really is a wonderful romantic suspense Christmas movie that I can highly recommend! So, be sure to take a break this holiday, sit back, kick your feet up and watch The Spirit of Christmas. Oh, oh... I LOVE 'The Ghost and Mrs. Muir and this movie looks just as enchanting. What a wonderful review. I can't wait to see this! Great review as it made me want to go get the movie right now! I think the Spirit of Christmas sounds like the perfect Christmas movie! I do love a good mystery and a holiday love story. What's not to love with The Spirit of Christmas? Looking forward to kicking up my feet and enjoying this movie, too. Thanks for the review, Cynthia! Sounds like a movie that I must see. Thanks for a great review Miss Mouse. I appreciate your opinion and will look for this movie, for sure. Wonderful review. And it looks like a sweet movie. I think I'll watch this during one of my holiday days off. I saw it today and thoroughly enjoyed it. Totally worth taking a break from my Christmas cleaning.